For this post, we are handing over to our first guest blogger, Nicos Georgiou from the Department of Mathematics. Nicos won three teaching awards and went on to receive a Teaching Innovation Prize in 2015 to fund a project in the Intersession Week for second-year students in Mathematics. After the second year of Nicos’ Intersession Week activities, we asked Nicos if he would blog about how it went. 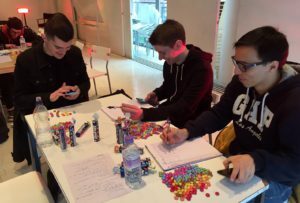 The organisation of the Mathematics Winter Intersession Week was successful for a second year in a row. Maths faculty and associate tutors joined forces to lead a variety of workshops which cater to the needs of the Maths students. If I had to chose THE most useful [workshop] it would probably be the Matlab sessions, they were a much needed refresher into skills that I will need for Numerical Analysis 2. A close second would probably be “How to Study”, it was good to listen to a guide of how to study with an actual focus on maths. Except for the sought out coding skills, the transferable skills we are aiming to improve include organizational and study skills, presentation skills and group work skills. This set is not random; most of mathematics students seek employment in the finance sector and – as students shared – these are skills sought out by potential employers during interviews. 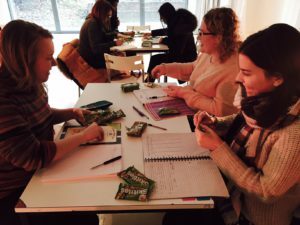 Perhaps what is intended as the “group work” activity is the most fun and the most versatile workshop and admittedly it may be relatively out of the ordinary. It is 5 hours long. During the first two hours, participants are actually being taught a bit of statistics. 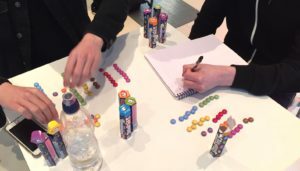 We show them how to organise data of certain types and how to do a statistical test to answer a very simple problem such as “What is the colour distribution of Skittles?” During the next two hours, they split into groups and collect data, i.e. they open an inordinate amount of candy packs. This year we are exploring the same question with Starburst, Smarties and M&Ms. The final hour is intended as a tutorial on how to present their findings and how to write a report that anyone can understand without compromising mathematical rigour. Then, they have a full term to write up this group project for their Probability and Statistics module as a required assessment. Without the events during the Intersession Week this would have been impossible. My favourite event was the Statistics Project: Groups and Data Collection, because I managed to find my group for the project, and we got a lot of work done and it was very handy towards our project which we will hand in at the end of term. 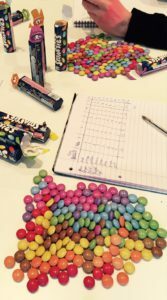 Repeat the smarties project that was tasty and encouraged me to actually do the project. I think all of the events should be repeated annually. Attendance is optional, which means people will only attend the events that are relevant to them. Adding recap sessions for previous modules would be a useful addition. Often after the holidays I find my memory is a little rusty. Everything was good, ticked every box . Excellent teaching, interesting sessions.